A close look at a lash tab, a fashion craze taking over backpacks across campus. Photo from Herschel Supply Company. The backpack is an essential piece of gear for the college student. Its purpose, to carry everyday items, is mainly functional. However, it cannot be overlooked as an important fashion item. These over the shoulder book holders range from sporty to sleek to artsy to anything in-between, and all offer different bells and whistles to catch consumers’ eyes with laser-like precision. Ooo! A hidden pouch for my laptop! How could anyone live without a zip-pocket that doubles as a cooler? Gimme now! While these rucksacks all have their various differences, a common embellishment is becoming more and more prevalent. 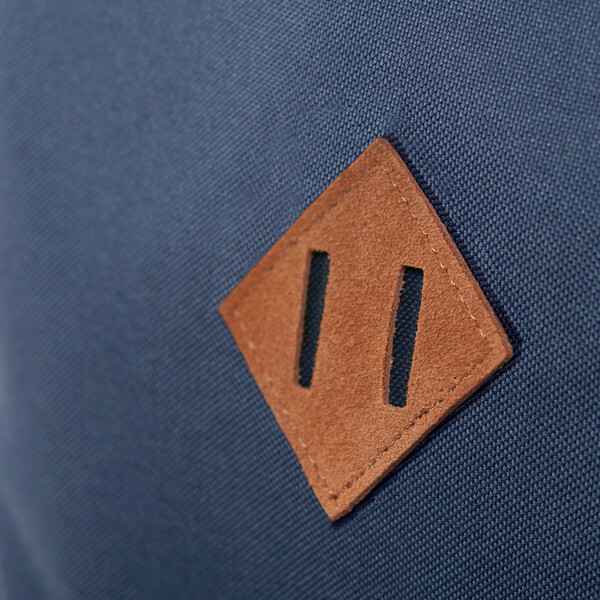 Although not on every backpack, stitched to the outsides of packs with increasing regularity are small leather diamonds with two slits in the center. This peculiar ornament is often affixed in the center, with many of its owners oblivious of its use. But why are they there? As it turns out, these little buggers are called lash tabs, and their prevalence comes from none other than today’s fashion vintage tendencies. According to the backpack aficionados at Carryology, lash tabs were originally placed on outdoor and Kayak packs to mount equipment and knife sheaths. At first, lash tabs were leather, but as time moved on, leather was converted to plastic in order to be more weather resistant. Lash tabs are now beginning to show up regardless of brand or style. The style has been around for a while, and message boards have discussed the phenomena from as early as 2009. The greatest frequency is with Herschel Supply Company’s heritage packs, which has a whole line of lash tab emblazoned packs with many imitators. Jansport also is not immune to the trend, as they have this distinctive mark on a number of models, including their messenger bags. Some brands use the tabs at greater rates, having more than one tab in the center, like L.L. Bean. Even with the prevalence of lash tabs, many consumers don’t consciously notice them. Most likely, they have seen backpacks with it and fail to consciously notice it when buying them. Sophomore Jolana Watson purchased a backpack with a lash tab merely just because it looked pleasing and she had seen other bags like it. While most people don’t use the lash tabs on the backpacks, it can be taken as a skeumorph, or a marking used to represent something comforting and familiar. Its purpose has been lost in the obscurity of the past, but as long as fashion keeps emulating the styles and designs of yesteryear, lash tabs will be on all sorts of luggage and people will be carrying this fashion statement for years to come. ‘The Walking Dead’ midseason finale: Where do we go from here?